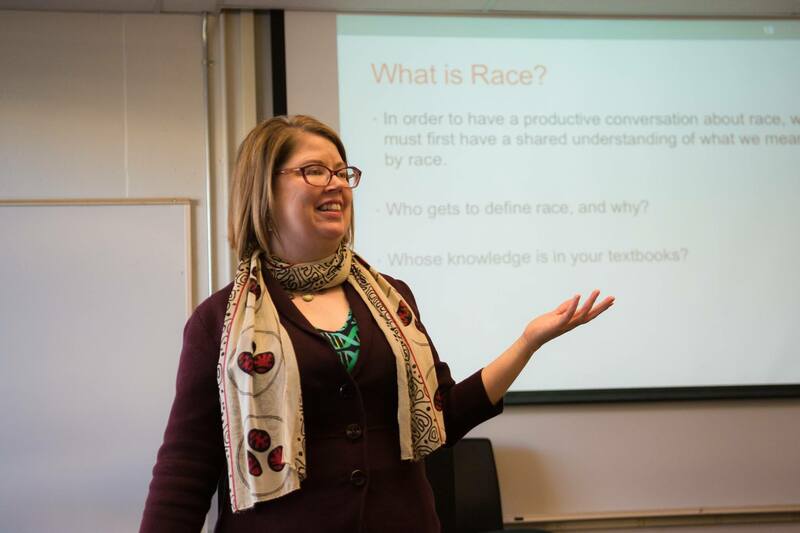 As a part of Cal Poly’s #InclusionStartsWithMe week, professors across several disciplines, including psychology, anthropology and biology, held a teach in regarding race and diversity on Jan. 26, 2017. In her presentation, Clement touched upon the history of eugenics, the problems with experimentation based on social constructs, and how students can learn to question the studies they read. Clement created discussion groups among students in which they discussed their own definitions for vocabulary like active “anti-racism” and “passive racism.” Students generally agreed that passive racism occurs when a person anonymously posts signs with derogatory messages targeted at a specific race around campus. Active racism occurs when one party confronts another directly, they said. However, the students found that their definitions for passive racism would actually count as active racism according to Dr. Beverly Daniel Tatum, an author and teacher with expertise in race relations, who Clement used as an example. “Structural Racism: A ‘system of advantage based on race,’ Tatum asks us to think of this type of racism like a smog we breath. It negatively affects us, but we don’t even really know it’s there. Active Racism: Blatant and intentional, usually not socially acceptable, most folks would agree that both yelling racist slurs at someone AND anonymous signs that say racist things would both be act of active racism. The term “scientific racism” was brought up in the discussion as well, in part because of historical instances of renowned scientists conducting studies based on the social construct of race. An example of inherent racial biases within the U.S. Public Health Service occurred in the Tuskegee Syphilis trials in Macon County, Alabama, 1932-1972. In the trials, experimenters used African Americans to measure the growth of untreated Syphilis. However, the study’s funding fell through in 1940, and the conductors of the study neglected to inform subjects that they wouldn’t receive treatment for Syphilis. This is one example of the history of medical practitioners’ unethical behavior when failing to treat a group of individuals based on race. Over the course of two hours, students tossed ideas back and forth, sharing their own definitions of racism and what they can do to understand the social contexts and potential racial biases behind scientific studies. “It’s my responsibility that the next generation of scientists, especially those studying human health, understand the most comprehensive results come from working with people across multiple disciplines in addition to biology, such as anthropology, sociology, and ethnic studies,” Clement said.